Scars can result from many causes including trauma, surgery, burns, chemicals, pressure and others. The majority of scars given enough time will settle down to a soft white line. Some scars however do not. These scars may be able to be improved with plastic surgery. The body’s normal response to wounds is to close the wounds by producing scar tissue to fill any defect. Once the body has produced this scar tissue it will turn off the production mode and start re-arranging the scar tissue . These phases correspond to the normal phases of a scar. This is that a scar following the normal course will get slightly thicker over the first 4-6 weeks while the body lays down scar. 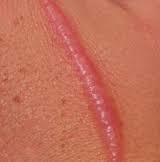 The scar will then gradually fade as the scar tissue is remodeled. This remodeling and hence fading of the scar usually takes between 6 and 9 months until the final appearance of the scar is obtained. There are a number of reasons why a “bad” scar may form. If there are problems with healing a wound the body will produce more scar tissue leading to a thicker more prominent scar. This can mean a wider final scar. Some scars will get to the thicker red phase and not remodel leaving a thick and reddened scar. This is known as a hypertrophic scar. Some scars do not “turn off” the scar formation and continue to get bigger with time. 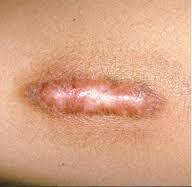 This is known as Keloid scarring. For all of these “abnormal” scars there are things that can be done to help improve the appearance, decrease any symptoms of pain, itching and cracking and also to help hide the scars where they will be less noticeable.  For each particular scar the appropriate techniques will be different but range from wearing special tapes through injections into the scar and also to revisionary surgery. At your appointment your surgeon will take a history of how the scar formed and thoroughly examine the scar. 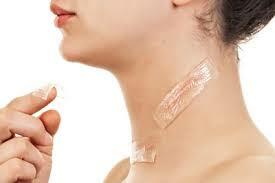 The appropriate options for your scar will be discussed and treatment commenced.